We had the closing on our house yesterday. Everything went pretty well. We are all so excited to get moved in. The house has 3 bedrooms plus a nice sized bonus room for the boys. 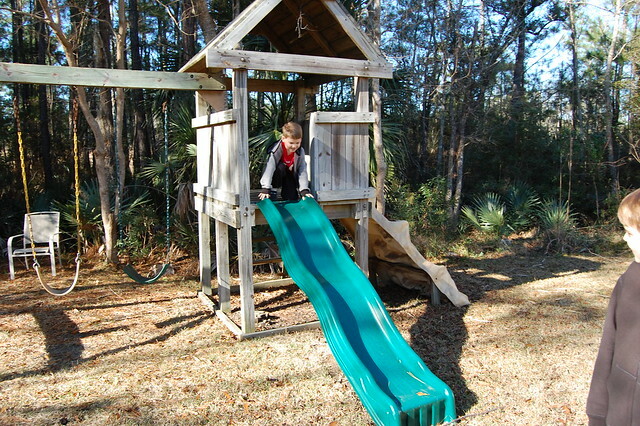 It also has a nice backyard and a playset for Matthew, which he really likes. It has two great porches. A front porch with rocking chairs, which they left for us. And a screened in porch in the back. We bought the patio furniture from them, which saved us a lot of money. I just need to either recover the cushions, or buy some new ones. I finished up the huge bargello band yesterday. Your new house is beautiful! Love the porches and furniture! ACK!!! Ok, I really need to do Dorothy. I literally gasped. lol! GORGEOUS!!!!!!! And your house -- huge congrats once again! I'm so glad you got the rockers and the back porch furniture! Those porches are so great! Lucky you! I'm going to imagine you stitching away in either place now. I bet you can't wait to move in!! It's a beautiful house! What a beautiful home to call your very own! congratulations!!! Congratulations Nicole! Dorothy is looking beautiful!!! Congratulations, Nicole! What a beautiful house. You will have so much fun making it your own. I wish I had those porches! Swoon! I can just see you stitching away on Dorothy while sitting on one of them. Speaking of, she's looking very nice! 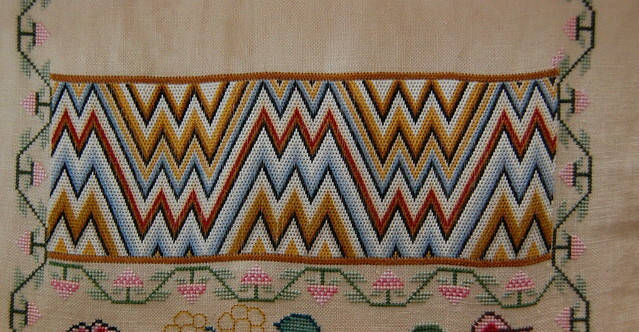 Love that bargello! OH wow...beautiful house and and good score on those rockers! I can see a lot of stitching happening on that screened in porch. Excellent progress on Dorothy. It's beautiful so far! Gorgeous gorgeous gorgeous.....jealous jealous jealous. A big CONGRATS on the purchase of your beautiful new home. Your Dorothy looks fabulous. Congratulations on your new home Nicole! How wonderful to have two porches and a large backyard! Love those rockers. Dorothy is looking gorgeous! I just love the colors in this sampler. Looks wonderful! congratulations and best wishes! I echo all the congratulations on your home. Looks like a wonderful place for a little boy to grow up. I am working on Dorothy Walpole, too. Evidently you started from the bottom. I wonder whether you enjoyed the floral section and the zigzag. Your work is beautiful. I hope to reach those sections some day! Congratulations on your own slice of paradise! It's a gorgeous home. Hope it has lots of wall space for hanging samplers! 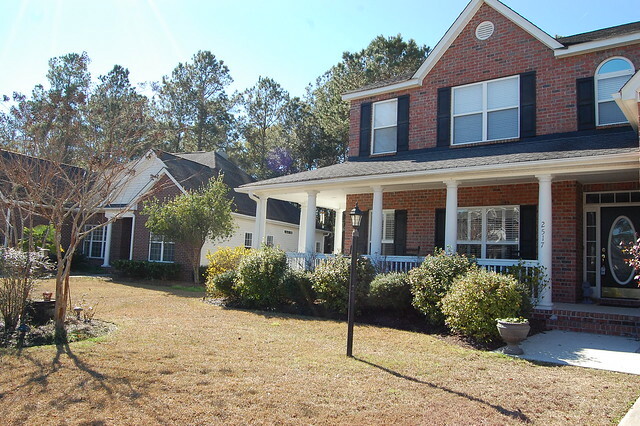 Your brick house is beautiful - and the guys will surely love that back yard as much as you and DH will love the porches! Look forward to seeing which colors you choose for inside. Dorothy is pretty special, too! Sorry, I hit publish before I was done, lol! Your Dorothy is just stunning, I love it!! The colors on this are gorgeous! And congrats on the new house. sounds like a lovely house and I wish you and your family lots of happiness and good memories there. 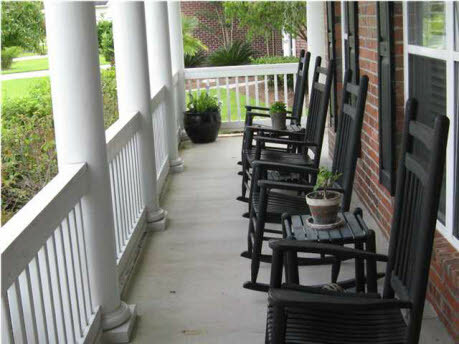 I love those rockers on the front porch! Love, love, love the new house!! I'm so excited for you and your family!! Love the rocking chairs on the front porch. Looks like a great place for stitching !! Congratulations friend !! Congratulations! The house looks lovely and I'm sure will be wonderful with your touches! Wishing you wonderful times and fond memories in your new home. Congratulations on your beautiful new home! Very exciting!! Dorothy is lovely as well - gorgeous colors. Congratulations on the house. It's beautiful. 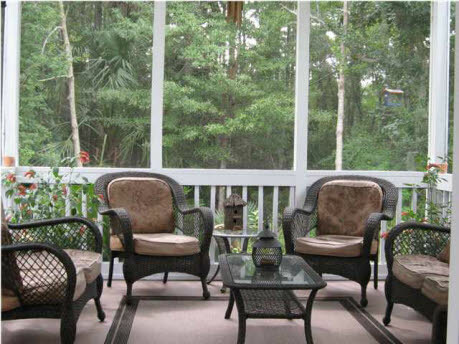 And that back screened porch....looks like a great place to sit and stitch with friends. Nicole, What a wonderful house. Gotta love a great front porch AND a nice screened in porch. That was great that they left those rockers.... I hope you and your family enjoy many years in your new home!!! I look forward to meeting you at this years PALS event at Myrtle Beach, now that I am officially in South Carolina I am ready to stitch at the beach :) Have a great day and again CONGRATS!!! Beautiful home and you will so enjoy both of those porches. I have one on the front of the house that is open and one on the back of the house that is closed in and both are just my favorite places to be!!! I love the work on Dorothy, beautiful. What a beautiful home!! Congratulations and may you have many years of happiness there! Congratulations!! What a beautiful house and yard! I'm sure you'll all enjoy it. I love that house! The porch - divine! And the sunporch - yummy! Enjoy! Yeah!!!!! I am SO happy for you guys! I love the pictures,... Thanks for sharing.... Can't wait to come for a peek! Such a beautiful home, Nicole, and that screened porch....what a little paradise for stitching. It looks so nice. I absolutely love Dorothy !!!! Those colors are out of this world ! Congrats to you and your family Nicole! It's beautiful and I envy you those two wonderful porches. I hope you will show us more when you get how you want it. 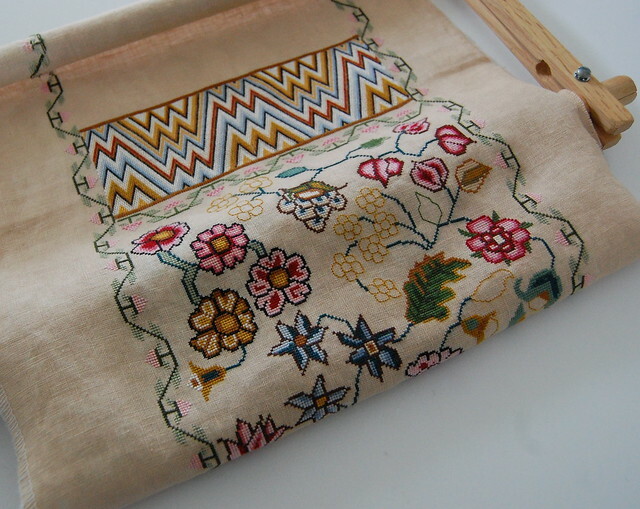 Magnificent stitching too! Your new home looks lovely! I also love the porches, something that my home lacks. They look like the perfect spot for stitching. Dorothy continues to impress. She is such an awesome design! Congratulations! Your home is gorgeous, as is your stitching. I love the screened in porch, and the front one as well. :) Enjoy! Big congrats on the beautiful home! And great going on Dorothy. Huge congrats on your new home, love the front porch and the back porch looks like a great place to stitch on Dorothy ;-)!!!!! Congratulations on your new home..I love both your porches..they will be nice for stitching ..
Have fun getting settled in your new home. Love, love, love your new home....BUT, that's a "rockin'" wonderful porch!! Nicole your house is just gorgeous!!! I have not seen it until today and it is a dream come true house it looks like to me. I love it and the porch out front is something I have always wanted on a house. I am so happy for you!!! Dorothy Walpole is even more beautiful seeing it stitched than it looks in The Scarlet Letter site and your stitching is so beautiful too. I bet you are really excited to be moved into your beautiful new home!! Big congratulations!! Wow Nicole, it looks like a real dream house. Much space to stitch. Your new home looks wonderful and great progress on Dorothy. Your new home, like all have said is lovely, and you'll enjoy the porch in the back. We have one its lovely to stitch on.